the leader of the dolphins who served Poseidon in his search and persuasion of Amphitrite. For his services, he was placed among stars, known as the constellation Delphin. For the ancient Greeks, the seas that surrounded their Mediterranean home were filled with wonders and horrors alike, depending on which tale you listened to. Monsters prowled the deeps, waiting for a chance to crunch on an unsuspecting ship full of clueless sailors and/or adventurers, and on the other side of the coin, beautiful maidens in the form of the sea nymphs glided through the shimmering waves giving aid to those same beleaguered sailors. Gods and goddesses, along with all of their attendants and servants made the deep blue waters of the Aegean Sea their home, along with all of the creatures who naturally existed there. In the chronicles of Greek mythology, one such proud animal was heralded for his service to the god who ran the whole show under the surface, Poseidon, and was rewarded richly for his assistance; DELPHIN, the head-honcho and King of the Delphines (dolphins). Dolphins were sacred and highly revered by Greek mariners and there were many stories told about their interactions with figures in Greek mythology. In all that he did for the sea god, Delphin's tale was actually quite a sweet and charming one! In the beginning of the myth, Poseidon, being the master of all the sea, figured it was high time to find himself a wife, and had had his eyes on a beautiful, creative and gentle sea nymph by the name of Amphitrite (Am-fih-tree-tee). The Lord of the Waves tried his very best to woo the young nymph with his many charms and epic beard, but it was a no-go; she just wasn't interested. Poseidon, not being used to hearing the word "no", upped his game and stalked Amphitrite all over the seas, hoping to win her heart (stalking was an understatement!). No matter what the guy tried, she would NOT return his heartfelt pleas for her hand in marriage. After a while, quite understandably, Amphitrite grew tired of being chased from place to place, decided to get the heck out of the neighborhood and go into some serious hiding (not an easy thing to do when the god of all the seas is searching for you and knows ALL the good spots!). 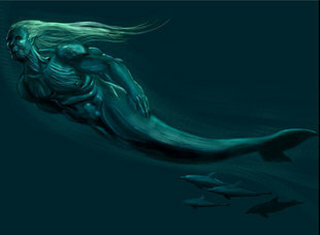 Poseidon, naturally, was heartbroken...this was totally the woman for him! He'd had many girlfriends and relationships in his long lifetime, but nothing that got his huge heart pounding and his brain in such a whirlwind mess! And yet, she wanted absolutely, positively nothing to do with him. Hopeless. Yet all was not lost, because as Poseidon was sad-slouching and moping around his underwater palace, sighing like an adolescent boy whose crush has just busted up his heart, one of his many animal servants came whipping by and noticed that the guy was in sorry shape. Delphin, the king of the dolphins, had never seen his boss so down in the dumps and so felt the need to put the skids on his racing around to assess the situation. Poseidon, giving out a heavy sigh, laid out his woes to the dolphin king, tossing in some seriously sad and poetic lines about true love. Delphin had to sympathize with the god; love could be a real puzzle. After Poseidon was done with his tale of heartache, Delphin patted his shoulder with a fin, blew out a mess of bubbles and told the god that he'd be happy to go out into the deeps and seek Amphitrite out... maybe, just maybe, he could work his dolphin charms on the young nymph and make her see just how besotted the god was with her. In any case, Poseidon's finned lieutenant promised to do his best as his wing-man, and zipped out into the darkness of the deep reaches of the Aegean Sea. It took Delphin a whole mess of time, quite a bit of patience and a whole lot of called-in favors to locate Amphitrite, who had found herself a cavern at the deepest part of the sea to hide out in. Being found by a dolphin was a lot less stressful than being found by Poseidon himself, and so the nymph had little trouble letting Delphin in to chat... and the dolphin king wasted no time in getting down to business. He waxed poetic about how much the sea god loved her and wanted to treat her like his queen. He used song (or at least what served as song in dolphinese) and his own sense of romance to slowly convince Amphitrite that Poseidon was the real deal and that he wasn't just out for a one-night-stand. Finally, after days of some pretty persuasive discussion, Delphin was triumphant in his mission to convince the young nymph, and she agreed to come back with him to be wed to Poseidon! Of course, Poseidon was fit to burst with joy when he found out the news and showered his bride-to-be with words of unending love, gifts fit for a queen of the seas and promises of an eternal life as his beautiful partner-in-crime. Delphin was so jazzed by the whole affair that he decided to plan and oversee the wedding himself, as well as be the one to do the marrying! And so Poseidon's palace was all decked out in the finest ancient wedding decorations, everyone who was anyone in the undersea kingdom showed up (as well as quite a few Olympians! ), all of the creatures of the seas were in attendance, the ceremony was everything you'd ever expect for a god, and the partying was crazy-intense. From that point on, Poseidon and Amphitrite ruled the waves as king and queen, and as a reward to Delphin for his distinguished service, the god gave the dolphin what the ancient Greeks considered the highest honor; he set him up in the skies as the constellation Delphinus, which can still be seen today! Delphin was such a big figure in the story of Poseidon that even in modern times, whenever a statue is made of the sea god, Delphin is always added in at his foot, shown as a faithful servant. Not a bad go for a simple dolphin!